The Huron River is one of the premier localities in Ohio for quartz specimens. Although much larger drusy crystals occur at Flint Ridge in Muskingum County, specimens of quartz crystals in combination with ferroan dolomite and other septarian minerals from the Huron River are far more attractive. In fact, the sharpest individuals compare favorably with specimens of Herkimer Diamonds from Middleville, New York. Equally impressive are specimens of multigrowth flower quartz in combination with 2nd generation ferroan dolomite. A number of habits of water clear, milky and smoky quartz occur at the Monroeville locality. Some of the more common habits found at the locality are drusy quartz, multigrowth flower quartz, doubly terminated diamonds, pseudo-cubical quartz and chalcedony. Masses and thick seams of milky gray, drusy quartz points are more common than large individual crystals. Distorted crystals occur more regularly than crystals of perfect form. A few crystals with indistinct and distorted smoky or milky phantoms have also been observed. Individual quartz crystals range from microscopic to 3 centimeters in size. 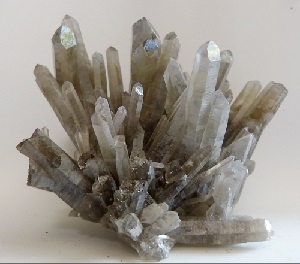 Quartz crystals from this locality occasionally have inclusions of other minerals, especially marcasite and pyrite. Dissolution of these iron sulfides causes light to moderate amounts of yellowish iron staining on some quartz specimens. At least three distinct generations of quartz are present at the Monroeville locality. Each of these generations is unique and easily distinguished from the other two. The very rarely seen first generation of quartz occurred between the 2nd and 3rd generations of ferroan dolomite. This generation produced snow white botryoidal chalcedony which is generally coated with second generation drusy quartz crystals. 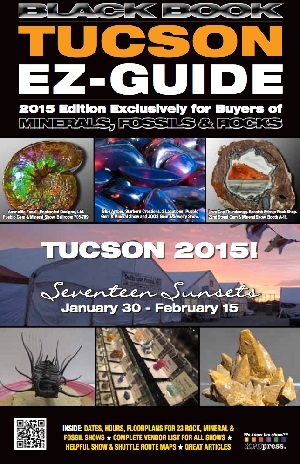 The 2nd and 3rd quartz generations produced well-formed crystals of dissimilar form. The more common 2nd generation of quartz occurred before the 3rd generation of ferroan dolomite. This generation typically formed individuals, small groups, drusy crusts or thick seams of partially clouded multigrowth crystals. The 3rd generation of quartz occurred between the fourth and fifth generations of ferroan dolomite. This generation of quartz forms beautiful individuals and groups of diamond like crystals that range from water clear to deep smoky black. An example of a 3rd generation diamond like crystal is displayed in the photo to the left. Since quartz does not occur as commonly as ferroan dolomite at this locality, and since two generations of ferroan dolomite occur between the crystalline quartz generations, specimens showing crystals from both of these later quartz generations are exceedingly rare. The Monroeville locality is one of the few Ohio localities that produce numerous crystal forms and habits of quartz. In all, six crystal forms have been observed at this locality. The most common of these forms are labeled A, B and C in figure III to the right. Crystal A describes the basic form; an hexagonal prism(m) in combination with positive rhombohedron(r) and negative rhombohedron(z). Although rarely as doubly terminated crystals, this form is employed by most 2nd generation crystals. Crystal B has the same basic form, but the prism faces are very small in comparison to the terminal rhombohedral faces. This is very common in 3rd generation quartz crystals. Some or all of the prism faces are occasionally absent in 3rd generation crystals as illustrated by crystal C. Pseudo-cubical quartz crystals have also been observed in the 3rd generation. This crystal form, illustrated by crystal D, is similar to crystal C, except that the positive rhombohedron is far greater in size than the negative rhombohedron. The prism faces may or may not be present on this form. A few examples of crystals with a second order prism face(a), labeled E in figure III, were also observed. This modification was found only on 2nd generation crystals. Rare trigonal pyramid faces (s), as described by crystal F, were also seen on crystals from the second generation. Quartz crystals from both the 2nd and 3rd generations have been observed with the basic quartz crystal form. Although it is often masked by the habit of the crystal, this form is more common in 2nd generation crystals. On the perfect crystal of this shape, the prism faces will be larger than the rhombohedral faces and the positive rhombohedral face will be slightly larger than the negative rhombohedral face.